This Grammar.com article is about Practice vs. Practise — enjoy your reading! Even though English speakers in the U.K. and North America use English in mostly the same ways, small differences persist. Many of these differences are in the spelling of words. Practice and practice are one of the examples of such words. In this article, we will discuss the meanings, origin, difference and how to remember which spellings are used where. Practice originated from late Middle English: from practise, on the pattern of pairs such as advise, advice. Practice is used as a noun in English language where it means the actual application or use of an idea, belief, or method, as opposed to theories relating to it. The principles and practice of teaching. The customary, habitual, or expected procedure or way of doing of something is also called practice. Product placement is common practice in American movies. Practice is also a repeated exercise in or performance of an activity or skill so as to acquire or maintain proficiency in it. It must have taken a lot of practice to become so fluent. Practice is the common and preferred spellings of American English and when ever you are writing for American audiences you should use these spellings. Practise is the British English spelling of practice. Before the 20th century, practise was used as the verb form of this word in both American and British English. Today, British writers and editors still prefer to spell the verb this way, but Americans have made practice standard. Practice is also the standard spelling of the noun in both American and British English. Practice and practise are two spellings of the same word. The only differences in meaning are in their usage in American and British communities. Practice is used as both a noun and a verb; in both cases, it can have any of several different meanings. The word is always spelling practice in American English. In British English, the noun form is also spelled practice. The word is spelled practise when used as a verb in British English. You can remember this difference because Spring Bank Day is a U.K. holiday that shares the S with practise, so you can remember to use practise as a verb with British audiences by imagining yourself practising a hobby on your day off. 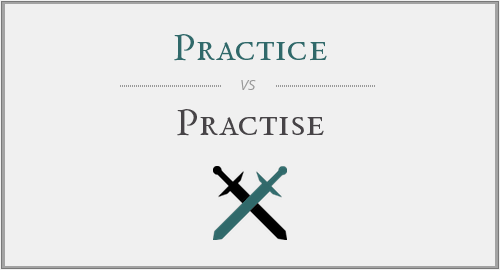 "Practice vs. Practise." Grammar.com. STANDS4 LLC, 2019. Web. 22 Apr. 2019. <https://www.grammar.com/practice_vs._practise>.